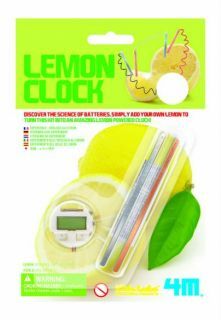 Discover how citric acid can be used to power a digital clock! Simply add your own lemon to turn this kit into an amazing lemon powered clock! Contents: 1 digital clock, 2 copper plates and 2 zinc plates. Instructions are printed at the back of the package.